Intent and the Dying Patient: What Acts are Legal and What Acts are Ethical? What is the intent of those who initiate an act and how can one tell if the intent is ethical or legal? Try thinking about this question these two cases. Both were real cases and in both the patients are in the very terminal stages of their illness and each is expected to die in hours, if not in 2 days or less. CASE A: The patient has lactic acidosis, shock, adult respiratory distress syndrome, disseminated intravascular coagulation and renal failure due to a gangrenous leg and the acidosis is rapidly progressing. The patient is unconscious and appears comfortable. The family, speaking for the patient, refuses a last ditch amputation of the leg after being told that this most likely may not save the patient’s life. The family wants the vasopressors (which is used to attempt to keep the blood pressure towards the normal range) and other IV support terminated since the treatment is now futile for the patient’s recovery. They do want the ventilation treatment continued. It is expected that the patient will die in a few minutes with the vasopressors absent. After an hour, the patient has not expired but is still unconscious. At that point, the family requests that the ventilator be disconnected and here one might infer that the intent was to finally bring the patient’s life to an end while the family is at the bedside. This is done and the patient promptly dies. CASE B: The patient is dying from end-stage cancer and is receiving a morphine drip and appears quite comfortable according to the nursing staff. The family, however, has requested the physician to increase the morphine drip to a rate which would cause the patient’s death presently. Presumably, the intent is to bring the patient’s life to an end. The physician agrees and writes the order. The nurses refuse to carry out this order and the patient continues living at that time. Do you see a difference in intent between these two families? It seems that the intent of the family in both cases was to finally and completely terminate the illness (and the patient’s life) even though in both cases the patient was not apparently suffering. The patient is dying and will be dead soon so “why not die now?” might be the argument. The intent seems to be the same in both cases, the natural trajectory of the illness to death may well be about the same but the precipitating actions are different: terminating life support and allowing the patient to die earlier from the underlying disease without that life support is considered legal. In the second case, it is the administration of a dose of morphine which, by the action of the narcotic, knowingly will bring the the patient’s life to an end sooner than if not administered. Such an act could be looked upon as illegal killing. But is there really no ethical difference between the two acts since both were ethical to end the patients’ illness or were both unethical because neither patient was acutely suffering and therefore the acts may have been for the self-interest of the families (to end the family's distress}? On the other hand, perhaps these cases may be examples of the belief that the real intent of those who advise or perform an act can’t really be guessed. What do you think? ..Maurice. Introduction to Clinical Medicine: Starting Medical Students to "Walk the Walk"
A physician taking a medical history is a dynamic process and is not simply the physician, as a stenographer, listing data in a chart but should be perhaps the beginning of a therapeutic relationship between the physician and the patient. But for it to be truly therapeutic it also has to be a humanistic relationship in which the patient is a subject and not the object of some medical application. In the first year "Introduction to Clinical Medicine" at the medical school where I teach, I start out at the very first day of what will turn out to be the career long path of becoming and then being a physician emphasizing this principle. Students on this first day are very uncertain about their role, their responsibilities as a medical student and they are apprehensive interacting with a sick stranger. Issues come up and as facilitator of a group of 6 students we encourage them to "let their hair down" and be open in expressing their concerns to me and the group. Often the issues deal with emotions both on the part of the patient but also frequently on the part of the student. Identification with the situation of the patient, though a valid mechanism for being able to express to the patient true empathy, nevertheless can lead to worry, depression and anxiety on the part of the student if the identification is related to similar ages or similar personal or family diseases. This identification has disrupted some interviews to the extent that the student can no longer continue talking with the patient because of emotional upset. What we present the students on the first day, before the first patient interview is an important to facilitate their further functioning. There is much to talk about especially from those facilitators who have had years of experience with all sorts of patients and illnesses. In my opinion, it takes more to help these students through this experience than from an academic professor of communication. You have to have "walked the walk". To give you an idea of situations which students do face in their first days with a sick stranger, I put together for them a quiz which I usually present, not to grade but as a takeoff for further discussion. Pretend that you are the student and decide which response would be most appropriate and beneficent for the patient. I'll give you my answers later in the Comment section of this thread. In the meantime, I would be interested to know how you would answer the questions if you were a brand new first year medical student who never performed a medical interview on a sick stranger. By the way, I am off tomorrow to do exactly what I have been writing about on this thread with two groups of first year, first day medical students tomorrow. ..Maurice. Introduction to the Interview by Maurice Bernstein, M.D. 1. You enter the hospital room of a 44 year old white male who has crumpled Kleenex scattered over the floor and who is coughing. What is the first thing you would say to him? A. “Why are you coughing?” B. “Why did you come to the hospital?” C. “Who are you?” D. “Are you in any pain?” E. If none of the above, what would you say? 2. You enter the hospital room of an elderly white man and there is a bad odor in the room. What should you do first? A. Ignore the odor completely? B. Immediately say to the patient “What is that bad smell?” C. Leave the room at once and call the nurse. D. Without disturbing the patient, during the interview attempt to identify and find the source of the odor. E. Go to the window and open it. 4. You enter the hospital room of a 55 year old black female who is moaning in apparent pain and after you introduce yourself what are the next words that you speak? A. “Do you hurt?” B. “When did you come to the hospital?” C. “Are you married?” D. “What is the matter with you?” E. You speak no words but immediately leave the room and call a nurse. 5. You enter the hospital room of a young woman about your age who was assigned to you by your instructor. You observe that she is weeping. What would you do next? A. Leave the room and tell your instructor that you are only a first year medical student and that you don’t know enough to help her. B. Leave the room at once without discussing what you observed with the instructor. C. Identify yourself and then hand the patient a Kleenex from the box on her bed table. D. First ask “What brought you here to the hospital?” E. Leave the room at once and call a nurse. Medical Maxims, Pearls and Principles: Do You Think Your Doctor is Using Any of These? If You were a Doctor, Would You? Because there are so many "unknowns" in the diagnosis and treatment of patients,as examplified by the above graphic of a unusual animal hybrid, there has developed a whole host of guides to medical practice that have been handed down over the many years and have been said to provide some help to your doctor in making a diagnosis or treatment. Many of these maxims, pearls and “principles” have never been subject to evidence-based testing but since some appear logical and seem to be helpful, well, they continue to be used. I selected the following list of 30 of these classic guides from the list that was brought together in the Art of Medicine section of the hand held device program “Clinical Medical Consult” 2009. My answer to the question in the title of this thread is that, yes, I think a lot of doctors have used at least some. Me too. But, in this age of hopefully evidence-based medicine, I wish that all were scientifically proven to be worthy of their current application! Look through the list. You may want to comment on the logic, illogic, silly, practical,prejudicial, rational, irrational statements and also those you think should be never more handed down from one generation of doctors to the next generation. Also, if you don’t understand the significance of one of these maxims, pearls or principles, just ask me. ..Maurice. 1. Drug reactions can be unique to a single person. 2. There are 3 ways to answer a question: “I don’t know/I don’t know but I’ll guess/I know". 3. Never say “never” and never say “always”. 4. “Occam’s razor” indicates that among competing hypotheses, favor the simplest one. However, “Saint’s Triad” reminds us of the importance of considering multiple separate diseases of a patient when the result of the history and physical are atypical for any one condition. 5. Common things occur commonly… when you hear hoofbeats think of horses not zebras. 6. Place your bets on uncommon manifestations of common conditions rather than common manifestations of uncommon conditions. 7. If what you are doing is working, keep on doing it. If what you are doing is not working, stop doing it. 8. If you don’t know what to do, don’t do anything. 9. Treat the patient and not the X-ray. 10. Never let the sun set on a pleural effusion. 11. Think twice, cut once. 12. All that wheezes is not asthma. 14. If it is dry, wet it: if it is wet, dry it. 15. Sutton’s law: “go where the money is”: do the most obvious test or biopsy first. 16. The only bowel sound that matters is a “fart”. 17. The child that does not resist invasive or noxious procedures is sick. 18. All bleeding eventually stops. 19. All drugs work by poisoning some aspect of normal physiology. 20. Don’t order a test unless you know what you will do with the results. 21. The less indicated a test is, the higher the rate of false positives. 23. Never worry alone, get a consultation. 24. The delivery of good medical care is to do as much nothing as possible…the more we intervene the more problems we might cause. 25. “Better” is the enemy of “Good”. 26. Never be the first to adopt the new, nor the last to give up the old. 27. When the test result and the patient’s exam contradict each other, always “believe” the patient. 28. The chances of a patient is pregnant is inversely proportional to the degree that she insists pregnancy is not a possibility. 29. “Poop” is all colors of the rainbow—don’t worry unless it is black or bloody. 30. Children will put anything anywhere, think foreign body. 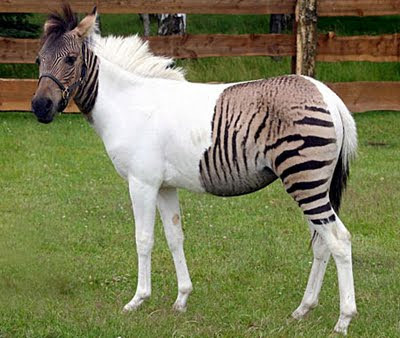 Graphic: Widely distributed photograph of a Zorse, horse-zebra hybrid as an example of potential complexities and confusions possible as doctors try to diagnose and treat human illness. 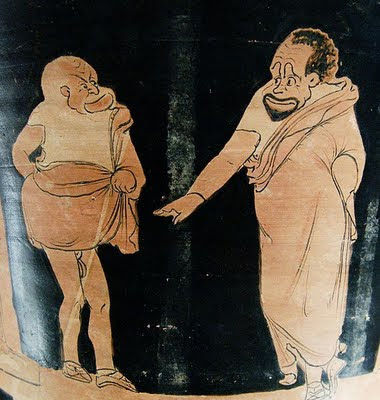 The graphic is a Master and his Slave painted Silician pottery from around 350BC-340BC. I am using this graphic for Volume 22 to represent what seems to be a common thread in the discussions within these volumes of Patient Modesty: A feeling of inequality and perhaps even abuse between the patient (either male or female) (slave) and the healthcare provider (master) with regard to the matters of genital modesty. If I am wrong in this analogy, let me know. Nevertheless, continue on with the discussions. ..Maurice. Graphic: A master and his slave. Side A from a Silician red-figured calyx-krater, ca. 350 BC–340 BC., Louvre, copied from Wikipedia. Here is something special I discovered to add to the current patient modesty discussion. It is a story written by a second year medical student Asrei Beyewitz in Pulse, a medical humanities publication of the Albert Einstein School of Medicine in New York. This and a host of other stories and poems about medicine can be found at this link. I received permission by the chief editor of Pulse and also from Ashrei to publish the story on my blog. Maybe Ashrei will join us here and he can provide us with more insight regarding modesty issues associated with management of his chronic illness. ..Maurice. This may sound strange, but I secretly looked forward to my colonoscopy. I was excited to see the people in the colonoscopy suite--the receptionists, the nurses and my doctor. I knew that they would like me, because I would be brave and respectful. That's what's always happened since I was diagnosed with Crohn's Disease ten years ago. During my multiple colonoscopies and countless doctor visits and other outpatient procedures, I invariably build up a rapport with someone, be it a doctor, nurse or staff member. I've always been a good patient, and now that I'm a second-year medical student as well, I can understand their work a little better. I expect them to sense my goodwill and to treat me in turn with respect and caring. This appointment got off to a good start: The woman who registered me seemed nice and appreciated my interest in the pictures decorating her cubicle wall. And I wasn't just being polite--I really did like those black-and-white photos of old TV and film stars. She even had The Honeymooners up there! I also got along well with the first nurse--we shared a laugh about the trouble I'd had finding a quarter to pay for my locker. But a few minutes later, my interview with the intake nurse took me aback. Staring at her computer screen, she recited a series of questions. Seated facing away from her in a gigantic reclining chair that seemed cemented in place, I couldn't turn around far enough to catch her eye. The nurse's lifeless, monotonous tones conveyed zero interest in who I was or what I had to say. I'd never felt so unimportant. To make matters worse, people kept interrupting us. The first time it happened, I thought that something serious must be happening--maybe a patient was having difficulties, or the computer system had crashed. No. It was lunch time. They needed to coordinate their take-out orders, and my nurse, it became clear, was the lunch organizer. Sometimes coworkers called her out of the room (but not out of earshot); other times they conversed right in front of me. Eventually I got so used to it that I began letting her know when someone was waiting for her. Still, I felt stung at receiving so little respect. Was I invisible? Couldn't their lunch plans wait a few minutes? Nevertheless, I swallowed my pride, reminding myself that healthcare professionals are people too, with needs of their own. Maybe my nurse had found that distancing herself from patients helped her to do a better job. When she expertly inserted my IV line, I felt I'd taken the right attitude. Our relationship wasn't very satisfying, but at least she had technical skills. Soon I was called to the procedure room and introduced to my next nurse, who would actually assist with the colonoscopy. She seemed down-to-earth and likable, but that's when things really started to go wrong. For one thing, she'd forgotten to put a bed in the procedure room. Then, when she did bring it in, she had me lie on it facing the wrong way. After we'd fixed these details, I heard someone down the hall talking excitedly about a "scholar." There must be some talented pre-med students shadowing the doctors that day, I surmised. Feeling a sense of kinship with them, and renewed self-confidence, I hoped that they would stop by my room. When my nurse brought in the student, I waited eagerly for her to introduce us. Instead, she started helping the young woman to put on scrubs. And while that was happening, I learned that this "pre-med" student was actually a ninth-grader. My pulse quickened, and my mind raced. Was I some animal in a zoo for children to gawk at? I was having a colonoscopy--the procedure where they stick a tube up your rear end. Couldn't they ask my permission before inviting a spectator? Struggling to sound calm, I asked, "Does my doctor know that a student will be watching my procedure?" My nurse didn't seem too pleased: I'd breached the unofficial patient's code of conduct. She blinked and said, "This is a teaching hospital," adding that patients should expect to be observed. I knew that this was utter nonsense. As a patient and a medical student, I care deeply about the principle that a patient's dignity should be respected at all times. I felt ready to fight for this. "It's probably okay," I said, "but it would have been nice if you'd asked me first." "Patients can always refuse being observed if they wish," she retorted, contradicting her earlier statement. All I wanted was an apology and an acknowledgment that they weren't allowed to coerce or take advantage of me. After some more back-and-forth, my nurse conceded her mistake. But the whole exchange left a bad taste in my mouth. When my doctor came in and learned what had happened, he told me that I was under no obligation to be observed. Before I'd even finished nodding, the student was taking off her scrubs; a few moments later, she was gone. Ironically, I still liked the nurse. I felt sorry for her that she'd been making mistakes, and I appreciated that she'd apologized for them. And when she started telling me about herself, I liked her even more. She'd had a lot of experience in surgery, she confided, but was still fairly new to the colonoscopy suite. She'd felt that she had to let the student observe because her boss had requested it. Although it didn't excuse what she'd done, I appreciated her candor. It was as if we were meeting for the first time. An hour or two later, I was waking up in the recovery area. Looking across the hallway, which looked blurry to me without my glasses, I saw someone walk by with a friendly wave and a smile. I can't say for sure, but I think I know who it was. Ashrei Bayewitz is a second-year medical student at Albert Einstein College of Medicine and a summer intern at Pulse--voices from the heart of medicine. "I've been interested in writing since middle school, when I composed mock newsletters to celebrate the birthdays of friends and family. I am continually surprised by the interesting and sometimes humorous connections that I make while writing. Around the time that I chose to go into medicine, my love of stories evolved into a special interest in illness narratives. My honors thesis at Yeshiva University showed how these works can help doctors better relate to their patients." NOTICE: AS OF TODAY SEPTEMBER 8, 2009 "PATIENT MODESTY: VOLUME 22" WILL BE CLOSED FOR FURTHER COMMENTS. YOU CAN CONTINUE POSTING COMMENTS ON VOLUME 23. With the current heated discussions around the United States about healthcare reform, there is one ethical theme that needs to be recognized by those on all sides of the healthcare debate: facts should be spread and not gossip. To do otherwise is to diminish the benefit of debate. Facts, as they stand, are also not immune from misinterpretation. In a debate facts must be presented in the context of how the facts were developed and in the context of how the facts are going to be used. Anything less than that twists the facts and converts them into simply gossip. When physicians inform their patients about the risks and benefits of a procedure or treatment, the facts presented must be pertinent to the clinical situation and how the facts are presented to the patient should be in the context which is for the best interest of the patient and for the best interest of nobody else, including that of the physician. That is part of the trust that the patient should have for the physician. As a reader goes through the comments to some of the topic threads on this blog, one can find numerous examples where the writers, out of exasperation or anger of the situation presented and out of sheer desperation to spread the word will take the facts and turn them into gossip by taking the facts out of the context from where they were obtained and then use those facts the out of context relative to the ongoing topic. Thus gossip is created which contributes nothing to rational discussion. Let us all be careful and use facts when discussing healthcare reform in the context of how the facts were originally documented. Let all physicians be careful to disclose the facts in a context that serves the patient in a beneficent way and without other motives. And let all writers to this blog take care to present facts in the context of how the facts were developed, to reinforce rational discussion and not to degrade it. ..Maurice. Graphic: Photograph, taken by me, of a sign originally stating “Spread the Gospel, Not the Gossip” but digitally modified by me using Picasa 3. If anyone wants to debate whether Gospel is Facts as compared with Gossip, do so, but that is another topic and what you write be sure to keep the words in context! OK..what's wrong with this? : if the people and the government want to improve healthcare in the United States and reduce healthcare costs, why not start by making state laws that require physicians, as part of their licensing, to engage in a certain amount of "pro-bono", no charge, community medical service to the sick every year? This idea, which I think has been thought of before, was currently brought up in a Los Angeles Times article by David Lazarus titled "Mandating pro bono work could help fix healthcare system". Mr. Lazarus also brings up the issue of the difficulty currently in having physicians in one state go to another state to perform that charity work because of state laws restricting practice to the state where the doctor is licensed. Nevertheless, mandating the participation of doctors to treat without charge in their office, hospitals or in "free clinics" could make an impact on medical care costs. Wouldn't it? Of course, it would represent altruism on the part of the doctor but as a participant in a free clinic in the Los Angeles area, it does give me a good feeling. What do you think about the idea? What would doctors think about it? And while we are at it, why not a bit of "pro bono" work by insurance companies and provide medical care policies even for a certain percentage of patients who can't pay for it? That would represent reducing health care costs to the taxpayers and providing care for the previously uninsured without more governmental spending. Any other suggestions about altuistic behaviors? ..Maurice. It is apparent by listening to all the current comments on the issue of healthcare reform measures in the United States that there is a missing point of discussion. We hear about all the bad stuff which might be coming out of our government in the proposed reform and all the bad stuff that has been created by the medical insurance industry and the pharmaceutical industry but have we heard any of the folks in the Town Hall meetings with the government or on the media talk about each and every citizen’s responsibilities to reduce both the monetary cost of healthcare but also the cost of utilization of scarce resources as part of the healthcare reform? Don’t the people of the United States have to sacrifice some things so they can stay healthy and allow the healthcare dollars to be spent on diseases and disorders of which the patients have no control in their onset or course? The smoker, the obese person, the alcoholic or drug addict, the “non-compliant patient” … and maybe even the terminally ill patient have some responsibility to others in our society besides themselves. Shouldn’t they be aware of the costs they are loading onto our healthcare system? Now, with 50 million more citizens planned to be added on to the system, beyond dollar burdens to our society how about the costs of attempting to utilize scarce resources such as organs, blood, limited technology and very importantly another scarce resource in this influx: physicians. To get an idea of both sides of this public responsibility issue go to this link and this link and finally this link and then come back and write us your opinion. Whether when my visitors happen to read my blog thread there has been a healthcare reform bill passed and signed into law or not, I suspect the issue of personal responsibility will still provide controversy. In any event, I would like continue a discussion here. I am not taking a side as yet, I want to learn. ..Maurice. In these days of conflicting views of healthcare reform and how it should be constructed, some people feel that “stopping for death” by patients who burdened by infirmities of age or terminal illness should relieve their burdens by rejecting further life-supporting treatment or requesting physician assisted suicide. Is this the way to solve the economic problems of providing needed healthcare to others to make them well or keep them healthy? On the other hand, would it be better to wait for death to have “stopped for me”? To do that and promote beneficence for the patient would be for society to provide proper palliative care (to simply relieve pain and mental or physical suffering) for any type of potential end-of-life disabilities and wait for death’s “carriage”. This approach actually might be less a financial burden on society than paying for perhaps futile attempts to simply preserve and prolong a difficult life. The question: should one have the opportunity to “stop for death” rather than waiting for “death to stop for me”? ..Maurice. 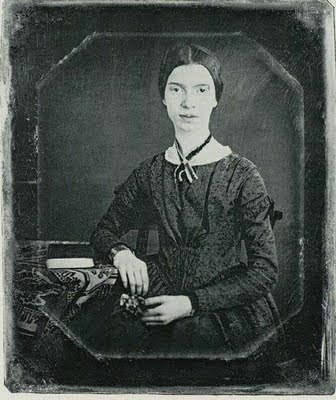 Graphic: Old photograph of Emily Dickinson public domain from Wikipedia. Reading the comments and appreciating the concerns expressed within the comments of both men and women visitors to these Patient Modesty volumes, it is clear that all would want the healthcare system to give patients this healthcare provider gender switch to use. Flicking, the patient could turn off one gender and turn on the one they want to do the more bodily intimate procedures and examinations. This switch, in many cases, is not readily available and that is unfortunate. But, at least, the switch available on this blog, if flicked may turn on a light onto this, previously unlit to many, issue. ..Maurice. 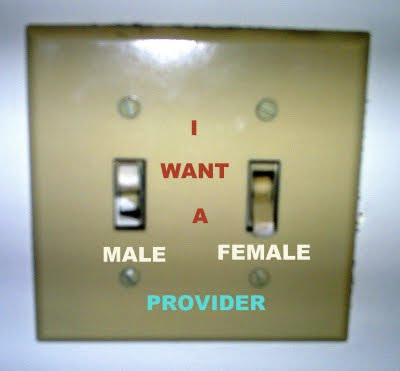 Graphic: The Healthcare Provider Gender Switch. A photograph by me and digitally modified by Picasa 3. NOTICE: AS OF TODAY AUGUST 20, 2009 "PATIENT MODESTY: VOLUME 21" WILL BE CLOSED FOR FURTHER COMMENTS. YOU CAN CONTINUE POSTING COMMENTS ON VOLUME 22. Another Ethical Dilemma: Palliative Treatment vs Waste of Resources: You Tell Me! I made up the following story to bring out a point. A 59 year old man in prison for the past 14 years awaiting the death penalty for murdering his wife, 2 weeks ago suffered a fractured hip when he slipped and fell in his cell. He has been in a lot of pain and hasn’t been able to walk since the fracture. He has had some pain relief with pain meds given by the prison doctor but still is in much discomfort. His execution is scheduled to occur in 2 weeks unless he gets a delay based on a recent submission to the courts by his lawyer. The issue posed to his doctor and the prison administrators is whether the prisoner should be now promptly scheduled for hip replacement surgery. The surgeons say such a surgery would definitely relieve his pain and discomfort and eventually allow him to walk normally. But with the execution scheduled within the near future is performing the surgery an ethical decision? What is the point of this story? I think it highlights one of the issues that the government and public are debating regarding healthcare reform in the United States. 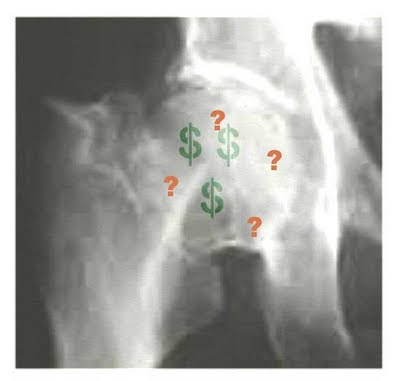 The issue of this story comes down to whether the hip surgery should be looked upon as an ethical palliative, comfort procedure to finally relieve pain or because of his impending execution represents simply an unethical waste of scarce resources that could better be used in the care of others with a longer anticipated lifespan. In general healthcare reform terms, the issue is whether the costly tests, procedures and treatments which are being provided to the elderly are really all palliative in intent and result or do they too represent a waste of resources and health dollars in a patient with a more limited lifespan than others. As with the prisoner in the story, we really don’t know if he will be executed in the 2 weeks. He may get a further delay in addition to his current 14 years of delay or may have the death sentence commuted to life imprisonment since the facts are that his wife had been a terminally ill cancer patient who was not receiving palliative care for her cancer pain and discomfort and he wanted to put her out of her misery. In that case, the hip surgery could be considered curative. Or would it? You tell me. ..Maurice. Acknowledgment: The presentation of this ethical conflict and the story telling method was used by me from "Cases in Bioethics-Selections from The Hastings Center Report Story 59", Third Edition, 1998 St. Martin Press, Inc. The current content of the story on this thread is my own. Graphic: X-Ray of hip fracture which I digitally modified with ArtRage and Picasa3. Minor Requesting Abortion: Anyone Want to Argue California Law? parental consent and without court permission. Code §§ 123110(a), 123115(a); Cal. Civ. 56.10, 56.11). Anyone want to argue this California law? By the way, there is an interesting document available about how to implement the California laws both for the healthcare providers and the teen agers. ..Maurice.